Br. 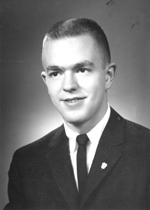 Gary W. Nagel, CSV, died on June 15, 1966 in a car crash near Nauvoo, IL, along with four others. He was 21. They died when their car went out of control in the rain and hit a tree. Br. Nagel was the driver. Also killed was his sister, Barbara Goethals, 24, of Moline, who was expecting her first child, as well as three Benedictine nuns and Nagel family friends: Sr. Gerald Meersman, OSB, 32; her sister, Sr. Mary Alice Meersman, OSB, 37; and Sr. Laura Washkowik, OSB, 29. They were returning from ceremonies at St. Mary’s Benedictine Priory in Nauvoo, where Br. Nagel’s sister, Donna Nagel, had received the habit of the Order of St. Benedict and became Sr. Mary Kristin, novice. Br. Nagel was driving his sister, Barbara, to Moline before returning to Chicago. He also was giving a ride to the three nuns, who were beginning their vacations. Br. Nagel was born the second of six children on May 22, 1945 in Moline, IL. He became acquainted with the Clerics of St. Viator in 1959 when he attended Alleman High School in Rock Island, where five Viatorian priests were members of the faculty. 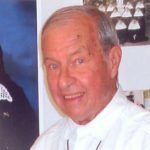 Following high school, he joined the Viatorian Community in July of 1963 at the novitiate of Our Lady of Arlington in Arlington Heights, IL and professed his first vows on September 8, 1964. Br. Nagel’s professed life was spent entirely as a scholastic at Loyola University in Chicago. Because of his outstanding scholastic achievement, Br. Nagel was chosen early in 1966 to complete his studies at Catholic University of America in Washington DC. He was scheduled to leave for Washington early in June, only his desire to be present for his sister’s habit ceremony prevented this. He requested permission for a later journey, which was readily given but, unfortunately, never used. A funeral Mass was offered on Saturday, June 18 at St. Joseph’s Church in Rock Island, for Br. Nagel and his sister Barbara. The concelebrated Mass was offered by the Rev. William R. Anson, CSV, Director of Scholastics, the Rev. John F. Brown, CSV, Master of Novices and the Rev. Francis G. DesLauriers, CSV, Spiritual Director to Scholastics. The sermon was delivered by the Rev. John O’Connor, principal of Alleman High School, and the choir of the Viatorian Scholasticate provided the chant. Burial took place June 20 at the Viatorian plot at Queen of Heaven Cemetery in Hillside, IL.